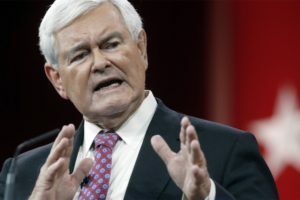 The United States and its allies should target and destroy Islamic State of Iraq and Levant’s (ISIL’s) technology on all fronts and send the terror group “back to the eighth century,” former House Speaker Newt Gingrich said. “I don’t know how often you have to see 15 women burned alive, how often you have to see people beheaded, how often you have to see people crucified, to decide these are evil people. Great societies have the capacity to destroy evil people if they have the courage to destroy evil people.” Gingrich said on July 20. Gingrich said that he “would put assets overhead” to ensure that all modern technology in “any area geographically occupied by ISIL” is targeted by airstrikes. “This is the most powerful nation in the history of the world and we’re up against a bunch of guys who are dangerous — they are not a JV team — but they haven’t got real power — they only have the power we tolerate,” he said. “I think [Trump] thought I was going to say I would like to be secretary of state or secretary of defense, but those are real jobs and I’m at a stage in my life where I would really just like to be creative,” Gingrich said.